AddThis can be added to many different kinds of pages and publishing platforms. After registering, you need to add our code to your website in order for our tools to appear. This article provides instructions and a step-by-step tutorial for manually installing AddThis on your site. 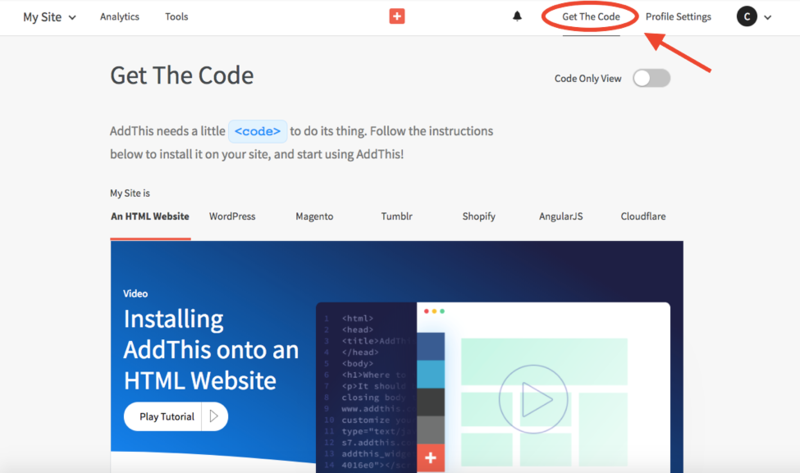 If you use a CMS like WordPress or Shopify, you can easily add AddThis as a plugin. Instructions for how to install AddThis on those platforms as a plugin or widget are also below. Login to the AddThis dashboard and click on “Get The Code” in the top right. Once on that page, copy the unique code snippet that’s associated with your profile. After you copy the code, paste it into your site’s HTML directly above the closing </body> tag. You need to add this code to every page you want AddThis to appear on. If you don’t, our tools won’t render. Once the code has been inserted into your website, you can activate tools in the dashboard. Simply choose the ones you wish to use, customize them to your likings, and then save and activate. Note: If you’d like to activate inline tools or the Tip Jar, you need to add an additional line of code. You can find this on the “Get The Code” page in the AddThis dashboard.